in general. Below are several links to great arcade sites. 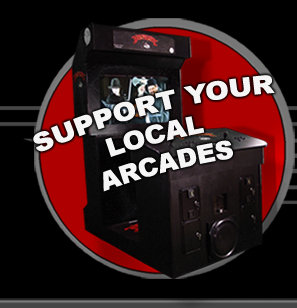 As a company that is selling arcade games, we want to give the arcade operates who buy our machines any and all extra help we can to help them promote their business and grow. As arcade enthusiasts many of our staff visit arcades regularly and are constantly looking for places that offer arcades. together and revitalize the industry. If you are an arcade operator, a private collector, or even just looking for an arcade in your area, drop us an email, and let us know how we can help you. We are also taking request of arcade locations for when we take DARK PRESENCE on tour! AURCADE.com - An excellent place to find arcades in your area and what games they have! ARCADE HEROES.com - Get all the latest arcade gaming news with great in-depth coverage!